1. Course outline has change. 2. New assignments has been added, please read every assignment. 3. Sexual Misconduct is a mandatory course for all EOM Leaders and Childcare Providers. 4. Instructors' Resources has been added. This will help instructors to prepare for their classes. It is very important that you attend all the classes before our June 2018 Holy Convocation. Every scholar is responsibly for completing every class to receive credit in order to be consecrated and/or ordained. If you can not attend a class, please contact your instructor to receive instructions on how to make up the class. Every scholar will be responsible for all assignments and completing an affirmation or test for each class in order to receive credit. 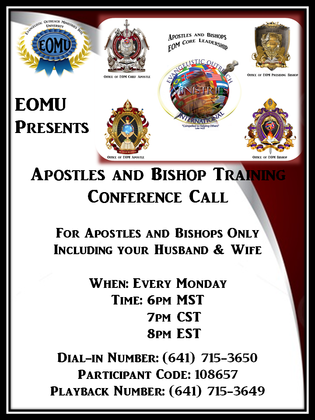 We encourage that the husband and wife attend this course alongside with you. They are apart of your elevation and will always be by your side. On this page you have your assignments, class outline, additional instructions and affirmation tests. Some assignments will refer you to another website; just click on the word "Assignments" and it will transfer you to the assignment location. Every scholar must take an affirmation test in order to be verified for each curriculum subject. You must achieve a 80% or High on every test. After each instructor grade you test, you will receive you score. If you do not achieve 80% or higher you must do refresher training and retake the test. There are no time limits on the number of time you can take the tests. Make sure you are ready to complete the test within 15 minutes. If you take longer than 15 minutes, you may not be able to submit it and must start over again. This test is not a pass or fail; it is only for seeing how much knowledge you received and understand.